When it comes to installing a new deck it’s best to leave it up to a team of professionals. Your deck has become old and outdated, and you’ve decided now is the time to replace your current deck. While many people have traditional wood decks, there’s another type of decking that is becoming increasingly popular. PVC decking has many benefits over wood decks, and it’s no surprise many are now choosing to install new PVC decks in their backyards. At Keys Deck & Dock Supply we have a large selection of PVC decking options with many different brands, styles, and color options. If you’ve decided now is the time to replace your current deck, we encourage you to check out the variety of PVC decking options we offer at Keys Deck & Dock Supply. What are some benefits of PVC Decking? Many of these brands offer a large amount of color and style options, so you can match your new deck to the rest of your backyard and your patio equipment. If you’re tired of your current deck, now is a great time to upgrade to new PVC decking. You’ll no longer have to worry about fading from the sun, a scorching hot deck, or slipping when it becomes wet. 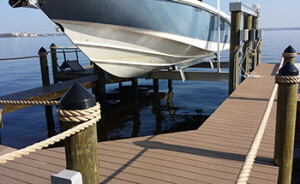 PVC decking in Pompano Beach is here to stay, and if you’re interested in installing a new deck contact our professionals at Keys Deck & Dock Supply today.